Partial correlations are great in that you can perform a correlation between two continuous variables whilst controlling for various confounders. However, the partial correlation option in SPSS is defaulted to performing a Pearson’s partial correlation which assumes normality of the two variables of interest. But what if you want to perform a Spearman’s partial correlation on non-normally distributed data? If you go to Analyze > Correlate > Partial … you will see that there is no option to select a Spearman correlation. There is, however, a way around this using a little coding. In this guide, I will explain how to perform a non-parametric, partial correlation in SPSS. To be able to conduct a Spearman partial correlation in SPSS, you need a dataset, of course. For our example, we have the age and weight of 20 volunteers, as well as gender. What we want to test is if there is a correlation between age and weight, after controlling for gender. For this to work, you need to enter a small piece of script into the SPSS Syntax Editor. Open up the Syntax Editor by going to File > New > Syntax. You now need to add the appropriate variables next to the NONPAR CORR and PARTIAL CORR sections. So, next to the NONPAR CORR enter all of the variables that will be involved in the partial correlation. In our example, this would be Age, Weight and Gender. For the PARTIAL CORR line you need to enter the two variables of interest in the correlation followed by a BY then the variables you want to control for. Make sure all of the variables you enter match the ones in your file correctly, otherwise the script will fail. The script itself is separated into 3 parts: NONPAR CORR, RECODE and PARTIAL CORR. The first is to perform a Spearman bivariate correlation for all variables and to add the Spearman rank correlation coefficients into a new file. RECODE converts the row type from a Spearman (RHO) to a Pearson (CORR). Finally, PARTIAL CORR performs the partial correlation on the desired variables by using the newly created Spearman correlation coefficients from the NONPAR CORR script. 1. To run the script, go to the Syntax Editor and with the NONPAR CORR section selected, hit the green play button. You will also notice that a new SPSS data file has been created and is now open. This is usually named ‘Untitled’, or something similar. Within this file, you will see the Spearman’s rho values and n numbers for each correlation. Click the green play button again to run the RECODE script on this. 3. Finally, still in the Syntax window, select the PARTIAL CORR code and run this on the same Unnamed dataset. This will perform the final partial correlation. 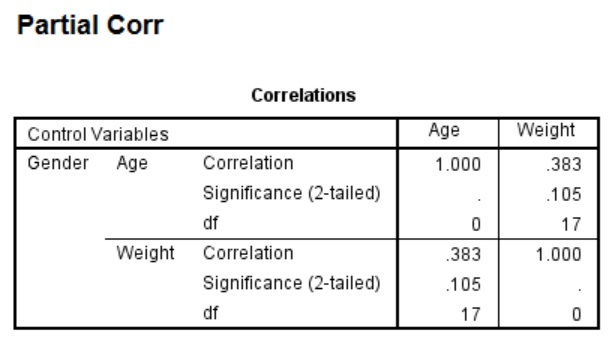 You will see in this example that the non-parametric partial correlation for age with weight, after controlling for gender, has a coefficient value of ‘0.383’ and has a significant value of ‘0.105’. Therefore, there is not a significant correlation for age and weight after accounting for gender. This has been so helpful. Thank you. Really clear and easy to follow. This was exactly what I needed, thank you so much! I agree with Rachael that is really clearly described. Sorry for the late response. The error you are getting, when do you get this? Is this for the first (nonpar corr), second (recode) or third (partial corr) part of the script? I am also experiencing this error. I get it at the second [RECODE rowtype_ (‘RHO’=’CORR’)] part of the script. I think this error is because you may be running the RECODE part of the script using original datasheet. Have you changed the ‘Active’ sheet to the newly created ‘unnamed’ one before running the RECODE part? (See point 2 in the guide above). I am in the process of creating a screencast video that will hopefully help. Also, are you sure partial correlations can be run by categorical variable? I thought it was only to control for a continuous variable. As far as I am aware, you can control for dichotomous variables (e.g. gender). However, I am no stats expert! This is really helpul, but can you control for more than one variable? E.g., 3 variables (1 continuous and 2 categorical). Thanks for the feedback. Yes, you can control for more than one variable. However, the more variables you are controlling for the less reliable the test may become because you may over-fit your analysis. If you have a large enough sample size then it should be okay. One rule, called the One in Ten rule (https://en.wikipedia.org/wiki/One_in_ten_rule), is suggested for regression analysis and could be kept in mind when doing a partial correlation. Briefly, for every control (or predictor) variable you use there must be at least 10 samples in the analysis. Great! So, in this case I would need to do something like Age Weight BY Gender By SES BY Ethnicity, right? This will control for ‘Gender’, ‘SES’, and ‘Ethnicity’. Thank you so much for providing this. I read the IBM instructions for syntax and was totally bamboozled; your tutorial and example was very easy to follow and was immensely helpful! FYI, I am using SPSS V24 on a Mac. When I ran the second part of the syntax [RECODE rowtype_ (‘RHO’=’CORR’) .] I received a warning message. I removed the space between “rowtype_” and “(‘rho’=’corr’) and re-ran without any further problems [ie. RECODE rowtype_(‘RHO’=’CORR’) .]. Thanks very much for the feedback, very much appreciated. Also, thanks for providing details for the Mac users. Unfortunately I am just on Windows at the minute so I cannot provide too much information on that system, but maybe in the future I can expand :). I’m on a Mac also and I found the warning message disappeared if I ensured I had clicked at the top of the syntax (so that the procedure was run from the right place and not halfway down the command). Thanks very much for this, I was having exactly the same problems as you (on a Mac) and found that clicking the top of the syntax sorted this. Your info sharing and advice has made a happy student! Great post. Do you know how to compute 95% confidence intervals for Spearman’s partial correlations using the syntax? My reviewers are requesting confidence intervals for all point-estimates in accordance with APA. Thanks for the comment. Unfortunately I do not know how to report 95% CI for this. Upon reading around this it seems quite a few people are asking the same thing. I have found a link to this website however, http://vassarstats.net/rho.html, which computes 95% CI from the r and n values. May be of use for you? This reply may have come a little late for you. As I posted below, there is no such thing as partial correlations for Spearman’s rho. Therefore, compute Kendall’s Tau, where you can calculate meaningful partial correlations. However, even for Kendall’s Tau, there is no defined sampling distribution, and so CIs can not be calculated. You can move forward in a few ways: First carefully review your data to be sure that Pearson’s r can not be used. Pearson’s r is pretty robust, and unless your data are very skewed from normal, you might be able to proceed (don’t get distracted by the type of data you collecting, you can apply Pearson’s r even to categorical data). If the first approach does not work, try a data transformation to make your data sufficiently normal to apply Pearson’s r (Spearman’s itself is a kind of rank data transformation). Finally, if you end up using Kendall’s Tau you might be able to apply bootstrap methods to develop a sampling distribution to create CIs around the partial correlations. This is a last resort for most people, and I’ve rarely seen this done. Thanks for the advice Ian, really appreciate it! I am running your script, but having an error below. The problem is the new “unnamed” or “unknown” data sheet does not exist or I can’t find it. What to do? So sorry for the late reply. Did you manage to sort this? It seems like the new results are not being opened in a new datasheet. Have you ensured the ‘/MATRIX OUT(*).’ part of the code is included before you run the RECODE part of the code. can i know why the partial coefficient value is higher than the spearman’s rho value? shouldn’t it be lower? Thank you so much for a very helpful post and also helpful comments and replys above. Is it possible to enter more than two variables at the same time (before BY)? Or do I have to repeat it for every depending variable I want to test? Many thanks for your comments and kind words. I presume you can enter more than 2 variables before the ‘BY’. 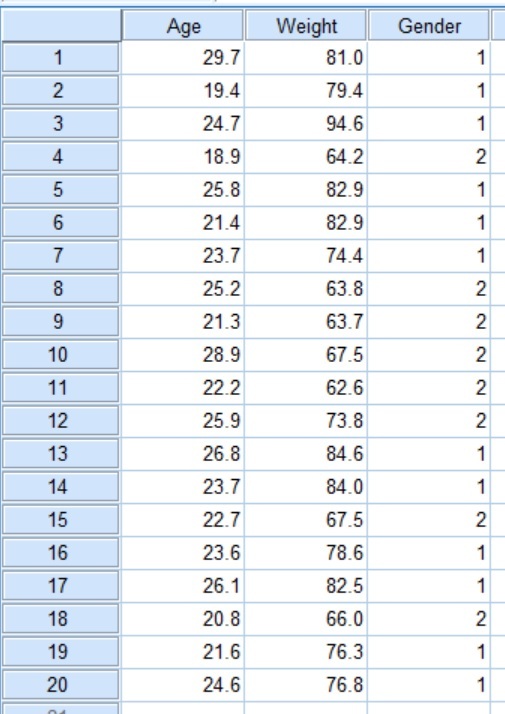 The results should then display a grid table so you can look at all your correlations within the same output. Let me know if there is an issue with this however. Thank you for the reply. It worked and gave a grid table as you said. If you want to test the correlation between one (undepenent) variable and all the others (depentend) varaibles, you can place that one first or last and write WITH between in the partial recode. Then the output will show only Age as a horisontal collum and Weight and Pain in the vertical collums. Super helpful! Can you please tell me how to flag significant correlations on the output? Hello! Thanks for this wonderful guide. Do you have any suggestions for how to plot the results of the nonparametric partial correlation on a graph? I cannot figure this out or find anything online. Unfortunately, one can not meaningfully apply the partial correlation formulas from parametric (usually Pearson’s) correlation to Spearman’s Rank correlation. You can apply the formulas as you have above, but the formulas were not developed for Spearman’s and the answers you get back are not meaningful partial correlations as they are with Pearson’s, so the Spearman’s the partial correlations are meaningless and can not be interpreted. This might not stop people doing it, but their resulting conclusions are fatally flawed. However, you can use Kendall’s Tau correlation for nonparametric correlation, and apply the same parametric partial correlation formula to get meaningful answers. Be aware though that Kendall’s Tau has a different meaning to Pearson’s r in explaining the correlation relationship. Unfortunately, there’s no easy way to apply significance testing to partial correlations based upon Kendall’s Tau since the underlying sample distribution is not defined (as it is for Pearson’s). So if you want partial correlations for nonparametric data, use Kendall’s Tau rather than Sprearman’s r.
Thanks for sharing. By the way, how to plot a Non-Parametric Partial Correlation In SPSS? Plotting the results is something I have found quite difficult myself. But I am yet to find a conclusive answer. Whether this is the correct way, however, I am not so sure – sorry. If you do find out, please come back and share! This is the SPSS syntax for the non-parametric partial corr the syntax example from SPSS forum (https://developer.ibm.com/answers/questions/223269/plotting-a-partial-corr-using-pairwise-exclusion/). Please feel free to comment on this syntax. Much obliged. Thanks for sharing. Did this work for you? The syntax looks like it is doing a regression, similar to how I described, and plotting the residuals this way. I’m using the SAS instead. 3) Plotting the residuals from (1) against the residuals from (2). Dear Steven, I just wonder how to cite this method? Conover, W.J. (1999), “Practical Nonparametric Statistics (3rd Ed.). New York: Wiley, (p. 327-328). This may be a good place to start? Thank you so much for this guide. One quick question: when I run it, my degrees of freedom are off, which impacts my p values. I think my degrees of freedom are being based on the variables in the correlation matrix, not the actual number of cases. For example, although I have a sample size of 100, my df when I run the syntax ends up being 26. Although I am controlling for 6 variables and am not sure exactly what the df should be, 26 doesn’t seem right to me. From your screenshots, it doesn’t seem like you had this problem. Do you have any thoughts as to why this would happen? Thanks so much again! So do you have 100 cases and all of these have matching data for the variables being controlled for, ie there are no missing data points?